Baked Oatmeal Baked oatmeal for breakfast is a great way to start any day -- it's easy to put together, quite healthy and can be made for 1 or for a crowd in almost the same time. Preheat oven to 350°F. Lightly grease 4 6~8oz. ramekins or a 6" square casserole dish or a pie dish. 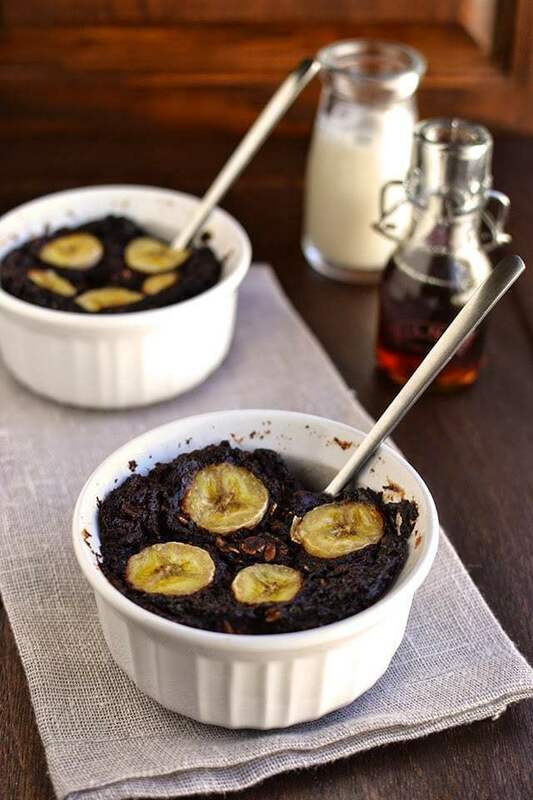 In a mixing bowl, combine the mashed bananas with the eggs (or the egg replacer mixture), cocoa powder, brown sugar, vanilla extract, salt, baking soda and baking powder. Whisk until smooth. Add the milk and mix well. Make sure that there are no clumps of cocoa powder. Pour into the prepared pan or pans and arrange the sliced bananas on top, if desired. Bake for about 40~45 minutes or until a toothpick inserted into the center comes out clean. Cut into 4 pieces and serve warm with syrup and milk on side.